Update: This eBay auction has ended, thank you to all who participated. Stay tuned — future FUN fundraisers are planned! Yesterday, I introduced World Vets, a 501(c)(3) nonprofit organization based in Gig Harbor, Washington. World Vets provides vital veterinary services, free of charge, to communities in dire need of veterinary help. Today is the second half of this spotlight, offering the art to help raise funds for the important work that World Vets does. Here is a piece I created called Pippa the Pencil Thief. I made each charm by melting glass with my propane-oxygen torch to create these shapes. Then they went into the kiln for 8 hours for a slow cool-down. Each charm is wired up (heart on nichrome wire, the cat and pencil on sterling silver) to create this copper cable chain necklace, 24″ in length. To learn more about this process and see additional samples of my work, please visit my glass art website. Pippa is part of the cast of characters of the popular @amazeballsgracie Instagram account. First, there was Gracie the grey tabby rescue. Her adoption was followed fairly quickly by Pookie and Pippa, two foster kitties. Truth be known, fostering lasted about 12 hours (if that) before they joined Gracie as full members of the house. My sister is the secretary for all three kitties. Here is a look back at Pippa’s rough beginning somewhere in Brooklyn, New York. But Why Do You Call Her The Pencil Thief? Bossypants, sassy. In a more serious way, she is wonderfully curious and has no fear. Playful. And sweet! Or really big ‘pencils’ like this one. You get the idea. Mischief and thievery! So How Does This Art For Animals Fundraising Work? Starting on Monday, October 9th, and running until Sunday, October 15th, there will be an auction page on this site. Bidding will start at $1.00 and bidding increments will be $1.00. You may bid as many times as you would like. 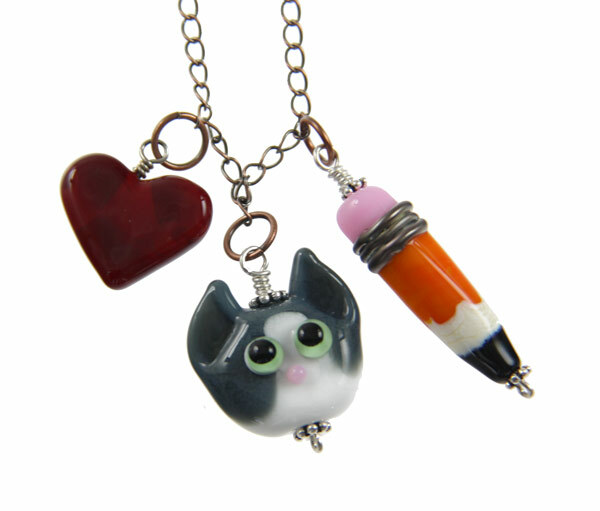 The winner will receive the exact cat/heart/pencil charm necklace pictured above. Additional photos and information will be available on the actual auction page. The winning bid will be paid directly to World Vets (a 501(c)(3) nonprofit organization based in Gig Harbor, Washington) by the winner. This donation will be 100% of the amount. I do not charge any fees or administrative costs on this site or to run the auction. Additional details will be posted when the auction is listed. This auction will be announced on this blog and on the following Instagram accounts. Be sure to follow them all so you don’t miss out. Please note: if you have questions about articles with my byline on The Spruce Pets (formerly about.com), please read this post about my articles on The Spruce. This site features my pets, photography, and pet news and reviews.